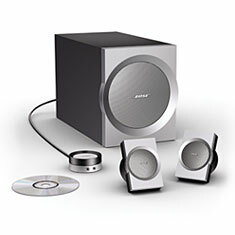 Bose Companion 3 premium multimedia speaker system features exceptionally clean, high-quality, full and rich sound and audio from computer audio sources and portable players. The multimedia speaker system includes compact Acoustimass module, proprietary TrueSpace stereo signal processing circuitry, tiny satellite speakers, multi-function control pod and mounting brackets. About reviewed Bose Companion 3 multimedia speaker system and gave Bose Companion 3 rating of 4 out of 5, and concluded that if you’re in looking for high quality sound for PC gaming with the added benefit of less wires and a speaker free desk then the Bose Companion 3 multimedia speaker system is a great hardware addition for your PC. With rich and vibrant sound it should satisfy most of your gaming and music needs. The external input jack also make it great for playing audio from your MP3 player.